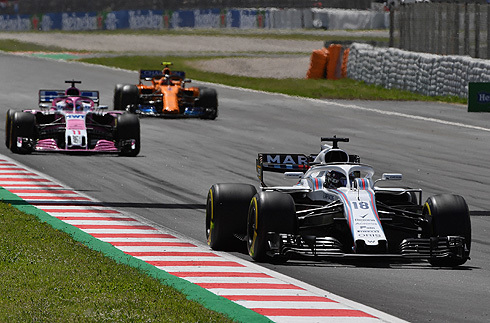 The 2018 Spanish GP was a race of two different stories for the Williams Martini team. 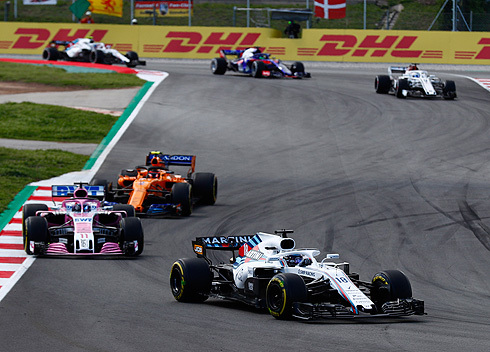 Their drivers Lance Stroll and Sergey Sirotkin would finish in 11th and 14th but for Lance his race was far more positive. He would have a great start and would run just outside the points for the majority of the race. But team-mate Sergey would have a far more difficult race suffering from issues with his seat as well as having a spin late in the race. Some positives could be taken away from the race but the Williams team is still coping with the fundamental issues with the FW41. 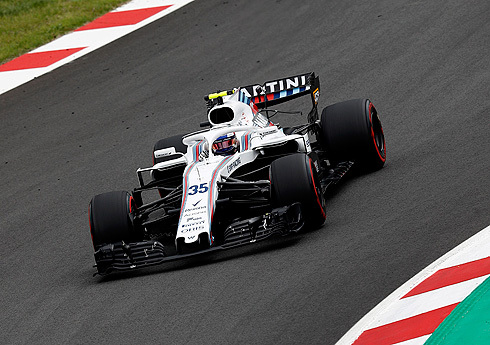 After a difficult weekend the Williams Martini team would see their drivers start from 18th and 19th with Lance Stroll ahead of team-mate Sergey Sirotkin for the sixty six lap 2018 Spanish Grand Prix. The places had been reversed after Sergey received his three place grid penalty. At the other end of the grid Hamilton was on pole from Bottas, Vettel, Raikkonen, Verstappen, Ricciardo, Magnussen, Alonso, Sainz and Grosjean in tenth. Of the top ten only Alonso would start on the supersoft tyre, the rest would start on the soft. For the Williams drivers they both would start on the new soft tyre, with each driver only having one of this tyre for the race. Hulkenberg and Ericsson would be the only drivers using the medium tyre. There were clouds but it was sunny at the start. The cars would move off and complete their formation lap and with the red lights going off it would be Hamilton leading but Vettel would get past Bottas. Alonso would have a poor start while Grosjean would spin at Turn three and crash heavily. Hulkenberg would make contact with the spinning Hass taking off his left rear wheel. Gasly would also be involved and he would retire also. The Safety Car would be deployed as a result of the crash. For Williams Lance was now running in 12th while Sergey was in 17th. Sergey would pit under the Safety car but would remain in 17th now running on the medium tyre. Gasly, Grosjean and Hulkenberg had all retired. Lap seven and the Safety Car would come in and Hamilton would make a good restart leading from Vettel and Bottas. Alonso would pass Ocon going around the outside at Turn three. Lance was running close behind Ocon while Perez was a similar margin behind Lance. Sergey was now up to 16th while running in 14th Vandoorne would be given a five second penalty for not going around a bollard correctly when he returned to the track. Lance was dropping away from Ocon while Sergey was a big margin behind Ericsson. At the front Hamilton was now leading Vettel by 4.8 seconds. Lance was now coming under pressure from Perez but Lance was able to keep him behind. Lap fourteen and Hamilton was extending his lead now out to 6.03 seconds. Right down to tenth there were gaps between the drivers son there was no real attacking going on. Lance had extended his lead over Perez. On lap nineteen Vettel would pit changing to the medium tyre returning in seventh. Bottas would pit on lap twenty one and would come out just in front of Vettel but it was a slow stop from Mercedes seeing Vettel able to get ahead. Vettel was also to get past Magnussen now running in fifth. Bottas was now seventh but he would get past Magnussen for sixth. For Williams Lance had also pitted dropping to 17th now on the medium tyre. Sergey was now running in 14th. Alonso would pit on lap twenty four changing from the supersoft to the medium. Sergey would move up to 13th when Leclerc pitted. Hamilton was still leading from Raikkonen, Verstappen, Ricciardo, and Vettel fifth. But Raikkonen would slow and he would report that he had lost power. He would be told to stop the car but he was able to recover and get back up to speed. Hamilton would pit on lap twenty seven taking on the medium tyre. Sergey had pitted again still on the medium tyre. Raikkonen would make it back to his pit and was pushed into his garage retiring. Verstappen was now leading from Hamilton and Ricciardo but the Red Bull cars had yet to pit. Perez would pit coming back out in 15th. Sergey would go a lap down running now in 16th. Lance was now in 14th behind Hartley. Lance was now running in 13th. Ocon would pit on lap thirty one but after a slow stop would return in 16th behind Sergey. Magnussen would pit switching to the medium tyre returning in sixth. Ricciardo would pit on lap thirty five taking on the medium tyre coming back out in fifth. Verstappen would pit from the lead taking on the medium tyre coming back out in fourth. With other drivers pitting Lance would move up to 11th while Sergey was still in 16th. The order was now Hamilton from Vettel, Bottas, Verstappen, Ricciardo, Magnussen, Sainz, Leclerc, Alonso, and Perez in tenth. 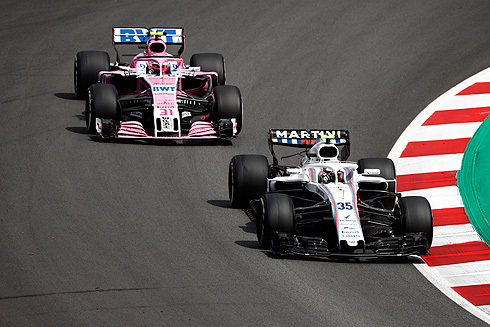 Ocon had been able to get past Sergey taking the 15th place from the Williams driver. But Ocon would retire on lap forty two pulling off the track with an engine failure. The Virtual Safety car would be deployed with Sergey again in 15th. Vettel would pit again on lap forty three taking on a new set of medium tyres. Vettel would drop to fourth behind Verstappen. Perez had pitted from 10th changing to the soft tyre returning in 13th. This would see Lance in 10th but on twenty lap medium tyres. With the end of the safety Car Alonso would pass Leclerc for eighth. But Lance would be hit by Verstappen while Perez would get past Lance taking tenth. Sergey had a spin at the restart and would pit switching to the supersoft tyre. The Williams drivers were now running 11th and 15th while Verstappen was running with a Red Bull with a damaged front wing. Vandoorne would retire saying he had lost drive seeing Sergey move up to 14th but he was two laps down. Sixteen laps remaining and Hamilton was leading from Bottas, Verstappen, Vettel, Ricciardo, Magnussen, Sainz, Alonso, Leclerc and Perez in tenth. 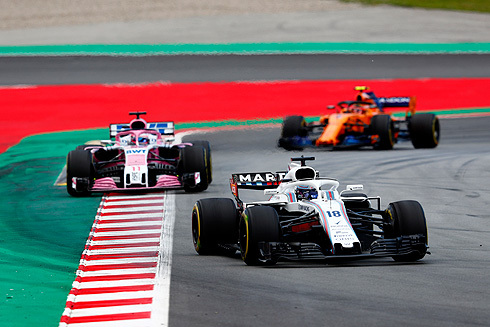 Lap sixty and the only real fight was Perez looking to get past ninth placed Leclerc. Perez would get past at Turn one using the DRS. The final laps would be completed and it would be Hamilton who would win thee 2018 Spanish GP. Bottas was second followed by Verstappen, Vettel, Ricciardo, Magnussen, Sainz, Alonso, Perez, and Leclerc. For Williams Lance and Sergey would finish in 11th and 14th. Neither car would finish in the points but it certainly was a race where Lance pushed hard making a great start and been close to the points all race. Sergey would have a difficult race but at least he would finish giving him more experience in his short Formula One career.